Mother’s Day, like many holidays, is one of those things. You know? I don’t want to turn this into a “feel bad for me” piece, or whatever, so, that’s not my intent. But, a day dedicated to thinking about what my mother did for me is not totally fun. My mother passed away in 1998. January 8, 1998. It was not totally fun, either. I mean, yes, I was an adult and didn’t need her in the sense that a child, still growing, still maturing, needs their parents. I was capable of taking care of myself, had a job and all that. I was in the midst of getting my Master’s degree at the time. It did, sorta, put a kink in my plans, though. In point of fact, it kinda screwed up my life. Some of which is obvious, as in, the mourning process took me off the grid for a couple months, made it very difficult to finish my master’s thesis, and some have told me I still haven’t completely finished mourning her death. I don’t really get that last part because I have worked really hard at mourning her. I’ve visited her mausoleum/tomb/slab in the wall and I’ve cried too many times to count. I don’t mean “cried” as in I had some tears over a Hallmark commercial. I’ve had those, too. But, I’ve had some real good cries, the kind you save for when you’re alone and will be uninterrupted. That’s the kind of cry that you just can’t share. It’s awful, face-contorting, dry-heaving, full of snot and salt water and is just disgusting to be a part of, much less see. I know what my mother did for me. I’ve had 13 years to think about it. So, I don’t need another day for that. You know how they say you don’t know what you’ve got until it’s gone. I know what I had and it’s gone. So, I should pay tribute to the other mothers in my life, right? I try to. Honestly. My favorite person in the whole world got a gift and I made her my best Belgian waffles ever this morning. I’m not a cook, even in the most definition stretching sense of the word. But, I’m super good at Belgian waffles. I make them “from scratch” with flour, sugar, eggs, milk and so on. I add extra vanilla and some cinnamon and nutmeg even though the recipe doesn’t call for it. But, the real reason my Belgian waffles are so good? It’s the eggs. First, I use about 50% more eggs than the is called for in the recipe. But, that’s not all. I separate the eggs and beat the whites. I beat them hard. Seriously, I am relentless. I’m just kidding. I beat them until soft peaks form, just like the recipe says. Then, I fold them into the batter, carefully, not over mixing. It’s important because you should be able to taste the eggs. Then, I’ve learned that you have to leave the waffles in the iron longer than the iron thinks you should. It beeps and I wait until panic sets in and I’m sure I’ve burned them… and they were golden brown. Almost perfect. And, for the first time, I felt like they were crispy on the outside and fluffy on the inside. I made those waffles with love, trust me. Normally, my idea of cooking is opening the can and warming up something in the microwave. Otherwise, I eat it cold or order it. So, for me to take the time and care that I did was because of the love I bear that woman. I would have spent some time with my step-mother but she was visited her daughter some distance away and we had my mother-in-law and other family coming over here for a party. So, there you go. That’s Mother’s Day. That and a little private thinking about my own mother. If you’re a mom, Happy Mother’s Day. If you have a mom, I hope she meant enough for you spend some time with her and whatnot. Parents are important in the lives of their children. I hope that I’m doing a pretty good job at it and I realize that, no matter what, I will most likely still fall short and have things to regret about how I raised them. I will make some poor decisions and probably have made a few already. But, at least it will not be said that I loved them any less than completely. 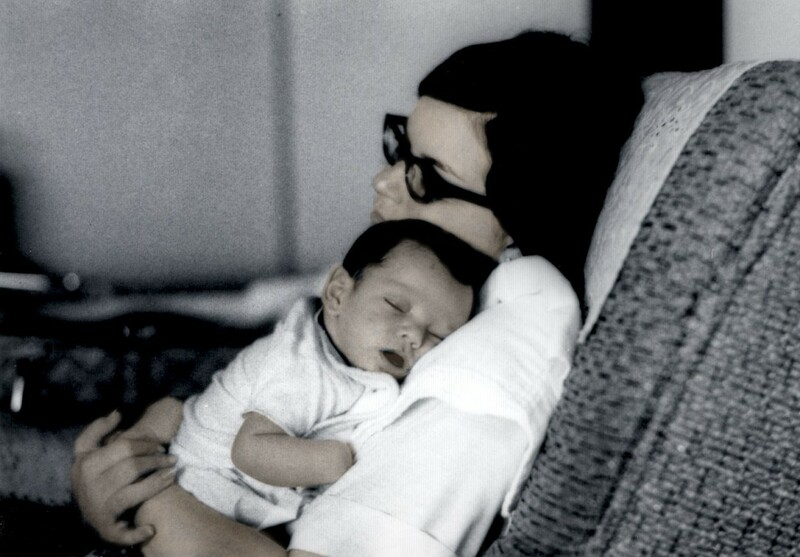 This is a picture my father took of me and my mother when I was, quite obviously, a newborn. Every time I look at this picture I get a catch in my throat and that full-feeling in my eyes like they’re going to water again. That baby is loved. Totally. There is nothing ambivalent about the way my mother holds that baby. He’s safe, protected, and cared-for. All of his needs are met. He’s beat from all of that smiling and eating and pooping. Clearly, he just had some delicious milk and needs to sleep while all the blood diverts to the stomach to digest that stuff. You can see from the tilt of her head that she adores that baby. She loves the smell of him and the feel of his hair on her cheek. She loves the sweet shallow breaths he makes and she can feel his tiny heart beating fast through his thin skin. Time slows down. The moment stretches for an eternity as the shutter clicks as the father realizes that, for his son, that is as good as life will ever be. And, if he was anything like I am today, that was the best it was for him, too. I love this picture, too, because I held my own babies like that. I hope to love my own children as well as my mother did, teach my own children as well as my father did, and be half the man my grandfather was. I have accomplished one of three so far.